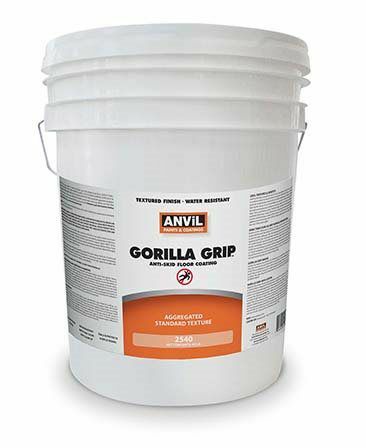 Anvil offers and patching products that deliver the Anvil quality in many unique and decorative ways. 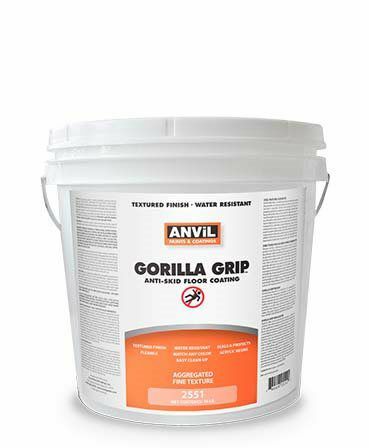 Gorilla Grip Anti-Skid Floor Coating is a waterborne acrylic non-cementitious coating that provides an aggressive texture on surfaces where increased traction is required. Explore all the possibilities that Anvil Specialty Coatings can do for you. A waterborne acrylic non-cementitious coating that provides an aggressive texture on surfaces where increased traction is required. Unique color adaptation properties perfectly complement Anvil Floor and Driveway Coatings by providing a decorative color match for high traction areas. It is non-flammable, low odor and is environmentally safe. Can be used as a decorative and protective coating on concrete, asphalt, wood, steel on high traction areas such as steps, floors, pool decks, patios, sidewalks, garages, carports, inclined residential driveways, safety ramps, balconies, etc. Will help prevent weather deterioration of concrete while forming a unique surface texture. Decorative color choices are limitless, for with the addition of a gallon of Anvil #1500 Acrylic Stain or Anvil #1700 Epoxy Show Coat, Gorilla Grip becomes the color of the stain or paint added. 40 pound kit covers aproximately 300 sq. feet with two coats. New regional Volatile Organic Content (VOC) regulations (SCAQMD) differ from the U.S. Environmental Protection Agency (USEPA AIM) national standards, this product can not be sold or shipped to the following area: the greater Los Angels basin. -A waterborne acrylic non-cementitious coating that provides an aggressive texture on surfaces where increased traction is required. -Unique color adaptation properties perfectly complement Anvil Floor and Driveway Coatings by providing a decorative color match for high traction areas. -It is non-flammable, low odor and is environmentally safe. 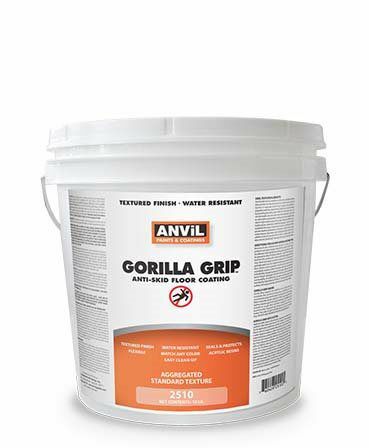 -Use on concrete, asphalt, wood, steel on high traction areas such as steps, floors, pool decks, patios, sidewalks, garages, carports, inclined residential driveways, safety ramps, balconies, etc. 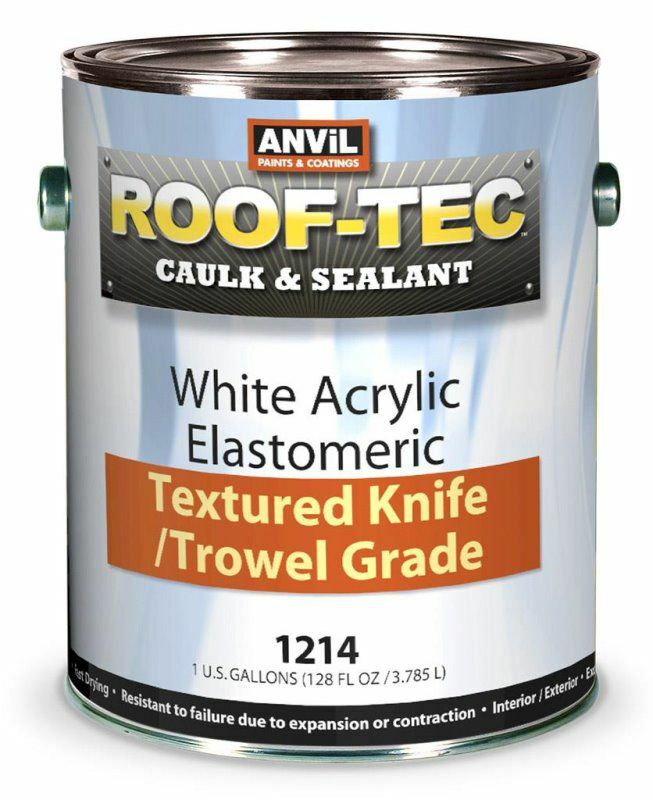 -Prevents weather deterioration of concrete while forming a unique surface texture. -Decorative color choices are limitless-Add a of a quart of Anvil #1500 Acrylic Stain or Anvil #1700 Epoxy Show Coat. 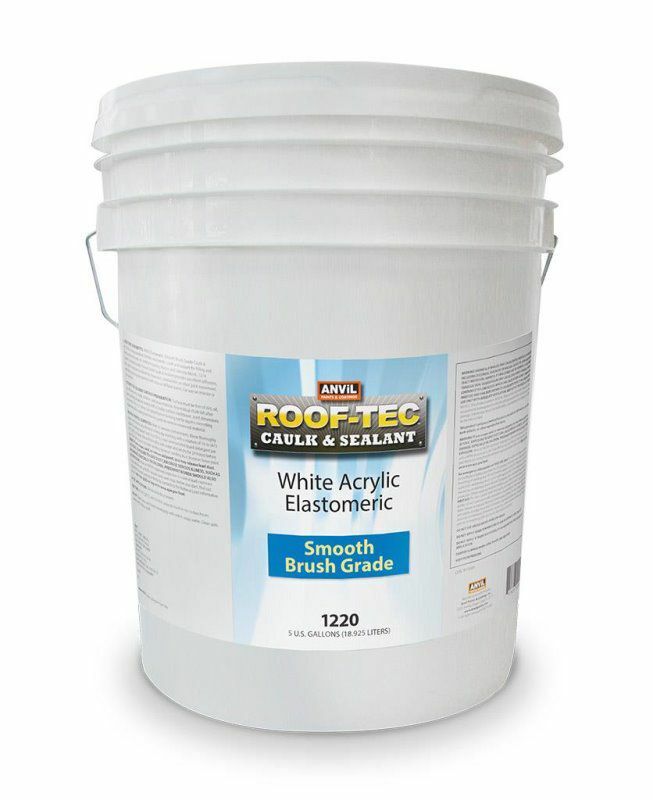 A heavy bodied, flexible, elastomeric patching material for filling and patching cracks joints and seams on; masonry, stucco, concrete block, brick, stone, marble, wood, metal and glass prior to applying finish. Provides excellent adhesion, long life, and is resistant to failure by expansion, contraction, or other joint movement. Fast drying and may be painted with latex or oil base paints. For use on interior or exterior surfaces. 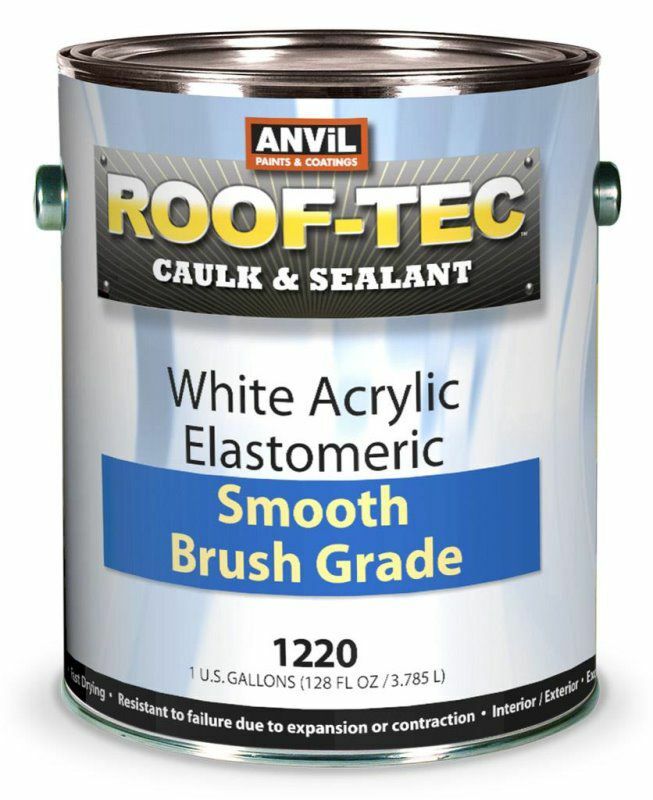 A heavy bodied, flexible, elastomeric caulk and sealant for filling and patching cracks and voids on vertical masonry, stucco , and concrete block. Fast drying and may be painted with latex or oil base paints. For use on interior or exterior surfaces. -Decorative and protective coating on concrete, asphalt, wood, steel on high traction areas such as steps, floors, pool decks, patios, sidewalks, garages, carports, inclined residential driveways, safety ramps, balconies, etc. -Unlimited color choices with the addition of a gallon of Anvil #1500 Acrylic Stain or Anvil #1700 Epoxy Show Coat, Gorilla Grip becomes the color of the stain or paint added. For application and usage information, click on the SDS. -Can be used as a decorative and protective coating on concrete, asphalt, wood, steel on high traction areas such as steps, floors, pool decks, patios, sidewalks, garages, carports, inclined residential driveways, safety ramps, balconies, etc. 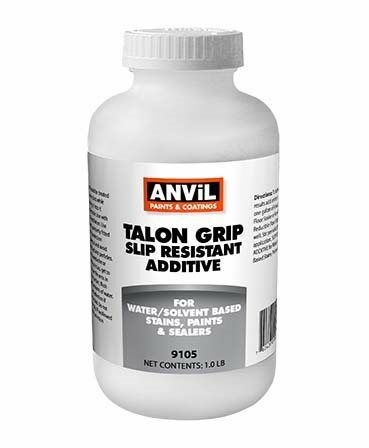 -Helps prevent weather deterioration of concrete while forming a unique surface texture. -Decorative color choices are limitless, for with the addition of a quart of Anvil #1500 Acrylic Stain or Anvil #1700 Epoxy Show Coat, Gorilla Grip becomes the color of the stain or paint added. -10 pound kit covers approximately 150 sq feet with two coats. 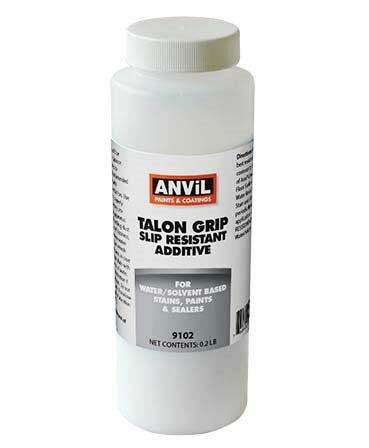 -Finely ground polymer material to be added to paint or stains to achieve a slip resistant surface on walkways, driveways, garage floors, patios, pool decks and other surfaces. -May also be added to paints to create a fine texture effect. -Optimum abrasion resistance and is more omfortable to bare feet on pool decks and similar surfaces than sand additives. -Low density and insolubility characteristics will reduce or eliminate settling and provide optimum performance in film forming water based or solvent based paints, stains and sealers without changing the viscosity. -Add to a gallon container of stain, clear sealer or paint. -May be also be added to paints to create a fine texture effect. -Add to a five gallon pail of stain, clear sealer or paint.